Surprise: Happy Birthday, Mr. Marc! I felt the pressure. “Don’t mess this up, Durban,” I thought to myself. I lightly knocked on Mr. Marc’s door, while everyone else (except 2 “decoy” employees) ran to the cafeteria to hide. “Good morning Mr. Marc,” I said as I walked in. Mr. Marc laughed & we chatted a little bit more. So, like the total boss he is, he jumped up & began to speed-walk outside. We were right outside the cafeteria & he started to leave the building & I said, “Actually, can you come in here before you go outside?” That was my brilliant response to him trying to exit the building…”uhhh, come to the cafeteria.” Ha! But it worked. Thankfully Mr. Marc walked into the cafeteria & he saw the entire office crammed into that little space, & he just started laughing! He then told them all about how I told him there were a lot of people & problems outside, & then to go into the cafeteria. After the laughter died down, Mr. Marc thanked everyone & spoke about how honored he was to be celebrating his 73rd Birthday & that it is a blessing to live that many years & to be able to work hard. Then, Mr. Lookens, Mr. Wantously, & Mr. Peniel gave speeches & they asked if anyone else had anything to say. There was a lot of Creole & I kept hearing “Rachelle” & then it was silent with everyone looking at me. Mr. Lookens said, “Rachelle, I think you have something to say.” I warned them that I would cry, even though that is not a very common response in Haiti & they gave me a napkin & said “no problem!” I spoke about how much I respect Mr. Marc & how much I have learned about leadership from Him & the deep love he has for the Lord & for the people of Haiti. Austin (another North American staff member) spoke about how Mr. Marc is like a father to so many people in Haiti, & how he is an incredible leader. The mark of a leader is the ability to duplicate oneself, & Mr. Marc has done a wonderful job leading up others & teaching them. Pastor Kenol prayed, & then it was time for cake! 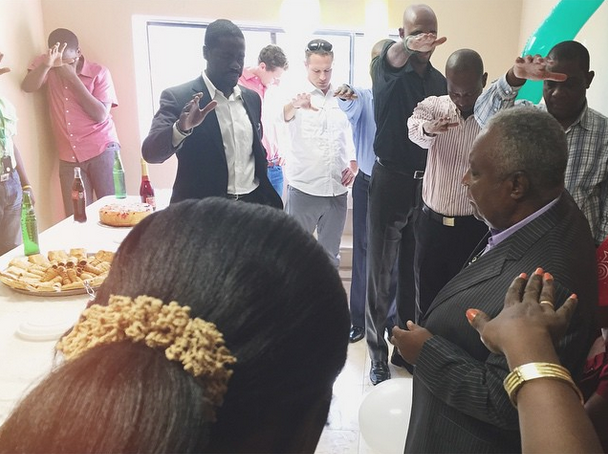 It had all the ingredients of a perfect Haitian party: Speeches were given, laughs were had, tears were shed, songs were sang, cake was eaten, & prayers were prayed. I am thankful to call these people family. I am thankful for Mr. Marc & his leadership. He is a role model in his love for the Lord & his love for the people of Haiti. Happy Birthday Mr. Marc! Here’s to many, many more! What a wonderful read! Mr. Marc sounds adorable and wonderful! Pays to be sneaky every now and then! LOL! Hallelujah, Christ is risen! Easter is the best. Easter is the forever reminder that we do nothing to earn God’s love. Jesus did it all. That’s the best news every single day, but I’m just extra aware of it this season. This artwork from the @sleepingatlast‘s song, “Three” is one of my favorite gifts. It is a daily reminder that value does not come from accomplishment. Some of my favorite lyrics from “Three”: — “Now I only want what's real To let my heart feel what it feels Gold, silver, or bronze hold no value here Where work and rest are equally revered I only want what's real I set aside the highlight reel And leave my greatest failures on display with an asterisk Worthy of love anyway” — I’d love to know—do you know your enneagram #? What have you learned?